Astronomers from Bonn University and the Max Planck Institute present the Effelsberg-Bonn HI-Survey. Radio astronomers from Bonn University and the Max Planck Institute have surveyed the entire northern sky in the light of the neutral hydrogen (HI) 21-cm line using the Effelsberg 100-m dish. This effort, led by Jürgen Kerp (Argelander Institute for Astronomy) and Benjamin Winkel (Max Planck Institute for Radio Astronomy), began in 2008 and has culminated today in the initial data release of the Effelsberg-Bonn HI Survey (EBHIS). In addition to the now released Milky Way data, the EBHIS project also includes unique information about HI in external galaxies out to a distance of about 750 million light the EBHIS project also includes unique information about HI in external galaxies out to a distance of about 750 million light years from Earth. Hydrogen is THE ELEMENT of the universe. Consisting of a single proton and an electron it is the simplest and most abundant element in space. One could almost consider the universe as a pure hydrogen universe, albeit with some minor “pollution” by heavier elements, among these carbon, the fundamental component of all organisms on Earth. The 21-cm line is a very faint but characteristic emission line of neutral atomic hydrogen (or HI). It is not only feasible to detect the weakest signals from distant galaxies with the 100-m Effelsberg antenna, but also to determine their space motion with extremely high precision. A special receiver was required in order to enable the EBHIS project. With seven receiving elements observing the sky independently from each other, it was possible to reduce the necessary observing time from decades to about five years only. Field Programmable Gate Array (FPGA) spectrometers were developed within the course of the EBHIS project, allowing realtime processing and storage of about 100 million individual HI spectra with consistently good quality. 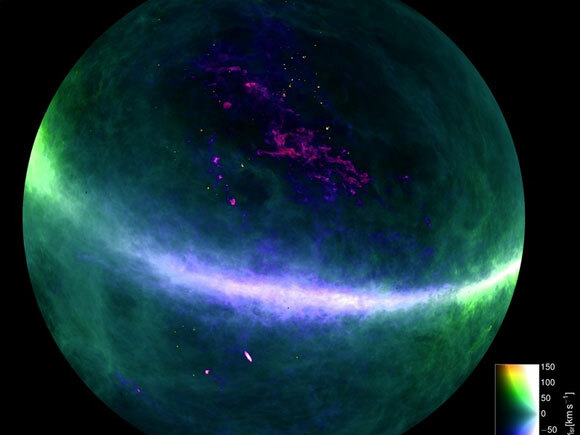 The individual HI spectra were combined using high-performance computers into a unique map of the entire northern sky and provide unsurpassed richness in detail of the Milky Way Galaxy gas. Astronomy students at Bonn University had unique access to the pre-release EBHIS data. In 2013 the European Space Agency (ESA) signed a memorandum of understanding with the Bonn HI radio astronomers. ESA was granted exclusive access to EBHIS data for their Planck satellite mission and, in return, Bonn students were given unique access to Planck data for their thesis projects. Twelve Bachelor, nine Master, and five Doctoral thesis projects have been successfully completed since 2008. The Square Kilometer Array (SKA), the world’s largest future radio astronomical facility, to be constructed in Australia and South Africa, will benefit directly from the EBHIS data. Owing to the construction of SKA as a radio interferometer, it is inherently insensitive to the faint and extended HI emission of the Milky Way and nearby external galaxies. Since the HI gas is measured very well by EBHIS, only combining SKA and EBHIS data will allow one to derive a comprehensive view of the interstellar HI gas. The Effelsberg-Bonn HI Survey will be a rich resource for science in the near and far future.Independent attempts to survey the entire northern sky with a 100-m class telescope are not scheduled. The EBHIS data will thus set the quality standard for the Milky Way Galaxy HI for the next decades. EBHIS is based on observations with the 100-m telescope of the Max-Planck-Institut für Radioastronomie (MPIfR) at Effelsberg. The project was supported by the German Research Foundation (Deutsche Forschungsgemeinschaft, DFG) for six years. 1 Comment on "Astronomers Present the Effelsberg-Bonn HI-Survey"
A fantastic sight of northern sky with Milky Way band and our neighboring galaxies of Andromeda and other local group. Hydrogen gas becomes predominant and its flow also is very fast. Are they drawn by the neighboring galaxies to be gobble up for the ultimate cannibalization ? Thank You.